This is the actual part that talks about the concert. It’s the National Taiwan Symphony Orchestra’s 70th anniversary, and what better piece (well, aside from like, Mahler 8) to commemorate than something as huge and glorious as the Auferstehung?! I talked earlier about how much I love this piece. Like, just yesterday and the with people over dinner. Having so far heard live Mahler’s third, fourth, fifth, and ninth, and now the second, it’s extremely apparent (especially with 2 and 3) that you don’t just listen to or see a Mahler symphony, you experience it. I am certainly not the first to have said this, and I felt somewhat that way about hearing the Munich Philharmonic perform Bruckner’s fourth last week. It was one of the greatest concert hall experiences I’ve ever had. But Mahler 2 is something bigger, and that comes across even in recordings. It’s more than just ‘listening to’ it. It is a production, an experience, it’s all encompassing, and I tried so hard to invite as many people as I thought would possibly enjoy it to come and experience this together. It is something that seems a terrible shame to miss out on, and something that in a concert hall, with this enormous ensemble before you, you cannot help but be moved. But I was also a bit nervous. Will the piece be done justice to? Will it be done right? This isn’t indicative of any lack of confidence I have toward the ensemble, and certainly not toward the conductor; it’s just that I had extremely high hopes, mostly because this piece means an incredible amount to me, it’s the first time I will be hearing it live, and I don’t see it coming up on any other programs, but also because I brought a handful of others along for the experience. I was so anxious. Excited, but anxious, and my heart was pounding. It’s a great feeling, though, settling into your seat (my favorite seat in the entire hall), people with you, like getting ready to sit down to an exquisite meal, or strapping into a car for a roller coaster ride. Shui Lan (retaining the Chinese name order, 水藍) walked out to give a bow and no sooner had the downbeat been given for the tremolo G in the strings than I had chills. It was like meeting a famous person in real life for the first time; to hear this piece live, finally, was breathtaking, surreal, almost paralyzing. The first movement was incredible. Again, there’s the danger of comparing a live performance (of almost anyone) to what are arguably some of the best performances of the piece in recorded history (Abbado, Mehta, Lennie, Boulez [if you’re into the latter two], and all the rest). That’s beyond unfair a comparison. However, while I did not expect the world-class studio-recording, polished perfection of a professionally recorded performance, I was absolutely stunned, almost literally so, by the passion and intensity of the ensemble. Shui Lan pushed, drove them so hard, and they followed suit, and the results were really shocking. For someone who has listened to this piece literally hundreds of times, from all different conductors and recordings, seeing this live, was like it really clicked what a violent, passionate, intense, lyrical, emotional work this is. This is what’s going through my head for the first movement. The monumental nature of the work strikes you in a different way live, especially with the intensity that the NTSO and Shui Lan brought to the first movement. The highs and lows and attacks and violence and beauty were all there. The second movement, in such outstanding contrast to the first, is delicate and graceful and beautiful, and it was here that the NTSO faltered the greatest. There were a few weak entrances of solo instruments, some pp that came out as mp or even mf, some lack of delicacy here and there, some problems with intonation, especially in execution of the pizzicatos cleanly and sharply, but overall it was still nice, although by far the weakest of the five movements. The scherzo was taken quite briskly, but it had all the ridiculousness and intensity it should have, and the comical St. Anthony preaching to the fishes came to mind; it brought a smile to the face. It’s a very technical movement and there were a few parts where they got pretty off-kilter, but they managed to get back together, in time, and the death shriek was appropriately frightening. It was almost too much, and not just loud, but frighteningly intense. So perfectly, then, does this piece lead into Urlicht, the first appearance of the human voice in the work. Hellekant, a wonderful, dark, rich voice, sings out to us, O Röschen rot! and we know we are nearing the final movement. I wish she’d given us a little more volume, floated more over the orchestra than among it, but she was elegant and angelic, and took her seat before the hell of the fifth movement broke out. The first trumpet, who’d had some issues with delicacy, intonation, and volume throughout the piece thus far, was less than graceful in his more exposed moments, and his entry in this movement broke a little bit of the magic. The first and fifth movements were by far the strongest, most deeply felt and perfectly executed of the work, and for that I was glad. I told my companions that the flute and piccolo solos in the silence of the fifth movement marked the halfway point, but long before we got there, the very statement of themes that would later be sung sent chills through me. They wrung every last drop of emotion and energy and fire out of the piece, but not in a Bernstein-esque or tactless way, but one that made you almost unable to breathe. The percussion swells that started with snare in the fifth movement reached such a hellish terror and volume it was almost as if the hall would crumble. Just spectacular. But then again, as I stated in my discussion with the fellow concertgoers, at the next turn with Mahler, it’s silence and chamber-like delicacy, and the offstage brass were outstanding. The horn calls were rich and strong, but distant and hopeful. The entire brass band and the timpani offstage were perfectly executed, and the flute and piccolo solos were pristine. It was a good thing we were sitting, because I wouldn’t have been able to keep standing when the chorus finally entered. Perfect sound, rich, warm, and soft, this marked the final, glorious ten-ish minutes of this symphony, some of the most ethereal passages in all of music. 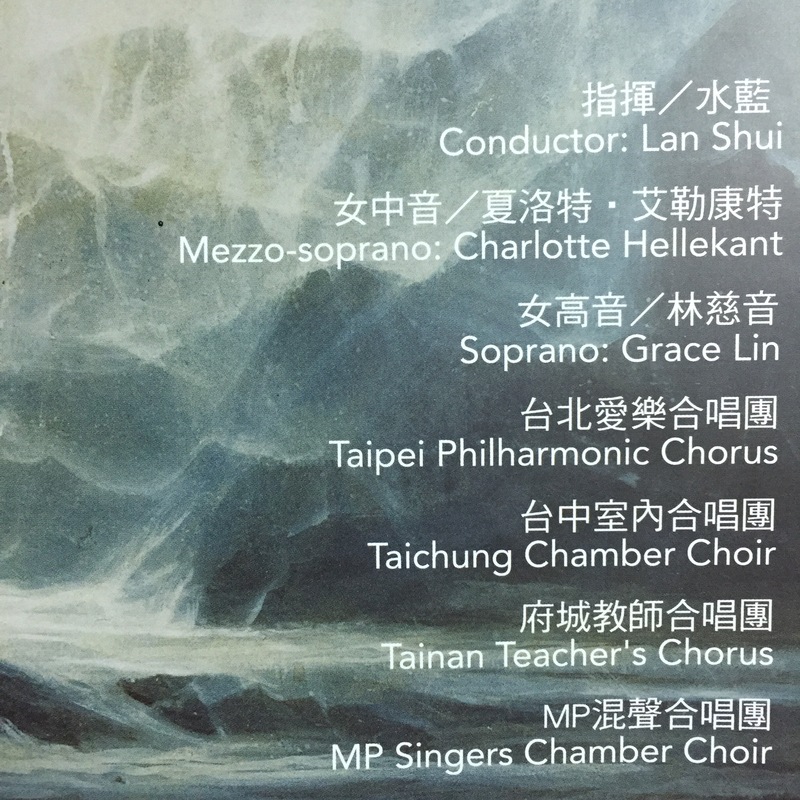 林慈音 was spectacular and effortless, and when she and Hellekant sang together, the orchestra backed off enough to hear their conversation in perfect harmony. It’s that moment, ja, auferste’n wirst du, mein Herz, in einem Nu! that always gets me, this heavenly, rich, climax of beauty and the sublime, and as corny as it sounds, I almost couldn’t stand it. Standing ovation. The crowd roared. And yes, you could be picky and say the oboe missed a note, a bass played a wrong note at the beginning of the first movement, the trumpet lacked finesse in a big way, and whatever else, but the overwhelming impression tonight was that a few hundred people gave everything they had to one of the greatest, biggest symphonies in the classical repertoire, they played the hell out of it. Technical faults aside (and they were not significant enough to damage my impression of the piece; it seems my companions didn’t even notice), I was absolutely blown away, stunned even, by the passion and drive put into this performance tonight. Shui Lan hit every high, every low, not just enough to be noticed, but to an extreme, he flipped through the score but didn’t look at it once it seemed, the intensity and focused energy and passion for this work was exhausting, but we so appreciated it. I was very pleased this evening. There is nothing in the world like experiencing a Mahler symphony, especially Auferstehung, live. It truly is an experience, something that I’d say borders on life-altering. With that many people, that many layers, the emotion, the scope, it really is a world that you enter when you listen, and there’s nothing else that can compare to it.